A comprehensive analysis of changes in body form and skeletal robusticity from the Terminal Pleistocene through the Holocene, leading to the modern European human phenotype. 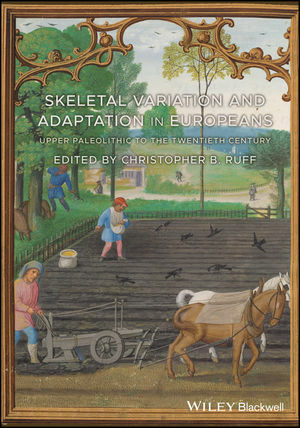 Skeletal Variation and Adaptation in Europeans: Upper Paleolithic to the Twentieth Century brings together for the first time the results of an unprecedented large-scale investigation of European skeletal remains. The study was conducted over ten years by an international research team, and includes more than 2,000 skeletons spanning most of the European continent over the past 30,000 years, from the Early Upper Paleolithic to the 20th century. This time span includes environmental transitions from foraging to food production, small-scale to large-scale urban settlements, increasing social stratification and mechanization of labor, and climatic changes. Alterations in body form and behavior in response to these transitions are reconstructed through osteometric and biomechanical analyses. Divided into four sections, the book includes an introduction to the project and comprehensive descriptions of the methods used; general continent-wide syntheses of major trends in body size, shape, and skeletal robusticity; detailed regional analyses; and a summary of results. It also offers a full data set on an external website. Skeletal Variation and Adaptation in Europeans will be a valuable resource for bioarchaeologists, palaeoanthropologists, forensic anthropologists, medical historians, and archaeologists at both the graduate and post-graduate level. Christopher B. Ruff is Director of the Center for Functional Anatomy and Evolution at Johns Hopkins University School of Medicine, Baltimore, MD, USA. Dr. Ruff has published widely in the fields of human osteology, bioarchaeology, and paleontology, and has served as editor of the American Journal of Physical Anthropology and the Yearbook of Physical Anthropology.